How common is Common Envelope evolution? It’s a fact of the universe that most stars are members of a binary system (or system of even higher multiplicity). The most massive stars (such as O and B stars) may have a multiplicity fraction of nearly 100%, meaning that every massive star is a member of a binary system. However, our knowledge of stellar evolution has most thoroughly treated the case of a single, isolated star evolving according to its own schedule, dictated by the well-understood equations of stellar structure. What happens when the binary stars have tight enough orbits to influence each other? If you didn’t see it last month, I highly recommend reading Kim Phifer’s astrobite on the fundamentals of common envelope evolution. When the orbits of binary stars are tight and one star evolves off the main sequence, it can fill its Roche Lobe and mass transfer can result. If the star expands beyond its Roche Lobe, it can engulf the other star. This signals the beginning of common envelope (CE) evolution, since the two stars now share a common envelope of gas. While the paper Kim wrote about last month examined whether or not CE evolution has the appropriate energy budget to unbind the envelope at the end of the interaction for the specific case of two actual binary systems, Nie et al. theoretically determine the fraction of binary stars that will eventually undergo CE evolution. Specifically, the authors look at red giants that are members of close binary systems and have ellipsoidal light variations in time, called “Sequence E” variables. It is believed that after undergoing common envelope evolution, these stars will become planetary nebulae (PNe), some of the most beautiful objects accessible with an amateur telescope and a dark sky (see Figure 1). Planetary nebulae are diffuse regions of ionized gas given off by the dying star, and have nothing to do with planets (or exoplanets). 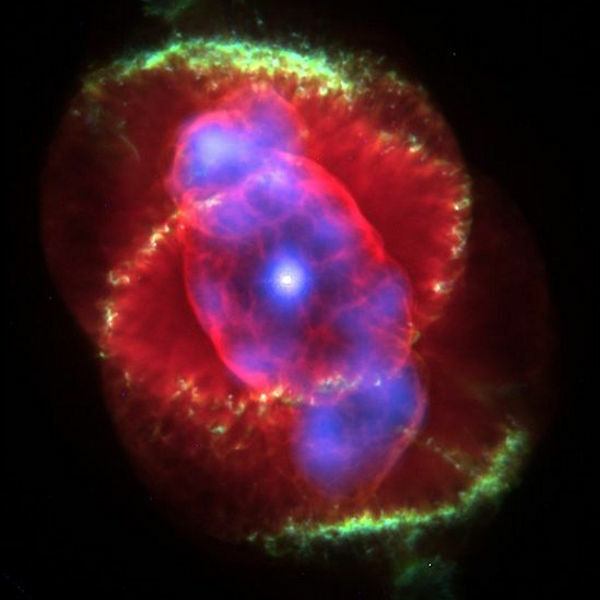 Figure 1: NASA/ESA/Hubble image of a planetary nebula believed to be shaped by the central binary stars. To start, the authors generate a distribution of orbital elements and mass rations according to published samples of our stellar neighborhood and of the fraction of Sequence E Red Giant variables observed in the Large Magellanic Cloud. Then, the authors draw from these distributions using a Monte Carlo simulation to create the initial mass distributions shown in Figure 2. Then, using an evolutionary model, they evolve these variables to determine which will undergo CE evolution. Previous astrobites about Monte Carlo techniques can be found by Nathan, Benjamin, and Dan here, here, and here. The model that the authors use to determine how a given binary evolve depends on the orbital elements and the mass ratio of the two stars in the binary. It takes into account many of the factors that Kim discussed, such as stable or unstable mass transfer and the energy needed to unbind an envelope. CE evolution can severely tighten the orbit of binary systems by dissipating angular momentum via friction in the envelope. Also, angular momentum can be converted to spin angular momentum by tidal effects induced when the red giant fills its Roche Lobe. The later stages of stellar evolution for lower mass stars (less than 8 M☉) can be summarized as follows. Once a core of helium has accumulated, the core contracts (because it is no longer being supported by fusion), it heats up, and the outer hydrogen layer of the star puffs up, while hydrogen continues to fuse in this shell. This is called the Red Giant stage, and the star is now on the Red Giant Branch (RGB). Then, when the helium core has grown large and hot enough by accumulating the ashes of hydrogen burning, the star will begin to fuse helium into carbon via the triple alpha process in the core. The star is now on the Asymptotic Giant Branch (AGB) of the Hertsprung-Russell diagram. It should be noted that in the author’s model any CE interaction with an RGB star or AGB star will likely eject the shell and halt the RGB or AGB evolution. 1) If the orbit of the binaries is too wide, there is just a single PN produced. 2) If the primary star fills its Roche lobe when it’s on the AGB, three things may occur: a) a CE forms, and the final product is a close binary with an AGB star core and close secondary, which will result in a PN with binary nucleus, b) a CE forms, but the stars merge. This merged star would then evolve to the AGB as single star, c) stable mass transfer results in a binary with an intermediate orbital period (no CE occurs). 3) If the primary star fills its Roche Lobe before it’s on the AGB (this usually happens only for stars more massive than 1.85 M☉), again three things may occur: a) a CE event results in a close binary with a red giant core (such as a helium-core white dwarf) and relatively normal secondary star. 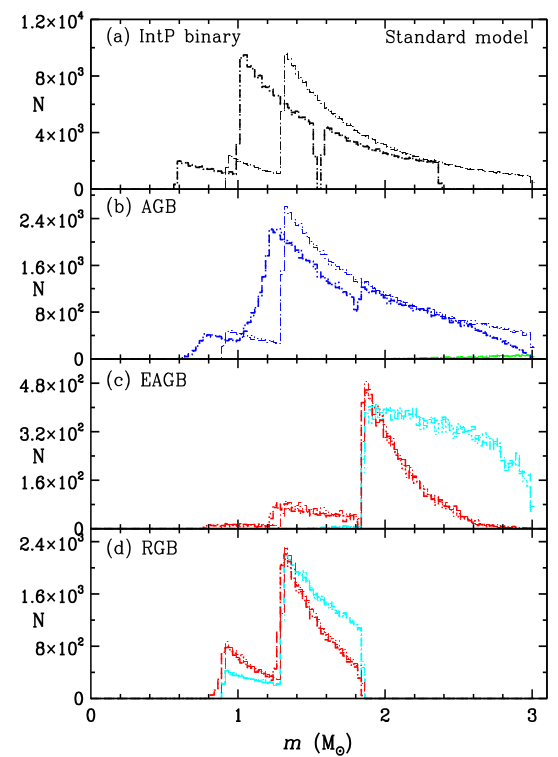 Unlike in the AGB case, this is not likely to produce a PN because the red giant core does not evolve quickly enough to high temperatures to produce a PN, b) a CE ensues, the two stars merge, and then continue on to AGB as single, more massive, star, c) or, again stable mass transfer results in a binary with an intermediate orbital period (no CE occurs). Fig 2: The result of the evolutionary codes. The thin lines show the initial mass distributions that were input to the evolutionary model, and the thick lines show the resulting distribution. Panel a shows the mass distribution for intermediate-period binaries, while b, c, and d show the distribution at the start of the common envelope event. As a result, the authors find that in the survey of resultant planetary nebulae nuclei, they have 7-9% close binaries, intermediate period binaries 23-27%, wide binaries 46-55%, and single stars 3-19%. The range in values is dependent on which observational study is used to calibrate the input distributions. Because many PNe are non-spherical, people often invoke binary stars as the source of asymmetry. However, Nie et al. find in their model that 90% of PNe are likely to come from a single or non-interacting star, which is contrary to theories that require binary interaction to produce a PN. One Star, Two Star, Brown Star, Blue Star Real-Time Stellar Evolution Finding dust grains (and planetesimals?) in a circumstellar disk A star with a fake ID?